UNION CITY, Ind. — The Cruise Master is back. And, it's riding on a cool new chassis. Georgie Boy Manufacturing has refreshed its well-known Cruise Master motorhome line with the Workhorse UFO chassis powered by GM's Vortec® 8.1L V8 rear gasoline engine. In doing so, Georgie Boy takes advantage of a platform that many are praising for its ride, handling and cockpit quietness. "The Cruise Master name has a lot of history as a touring coach, and we thought a motor home built on the UFO chassis was perfect for rekindling this great brand," said Mike Scheetz, vice president of motorized product for Coachmen RV Group. "One of the things we like most about the UFO platform is all that it does to improve driver and passenger comfort. With the engine in the rear, there is much less cabin noise and less cabin heat. Also, because we don't have a drive shaft running the length of the coach, there is less vibration; and we can build in more pass through storage." This particular model features expansive pass-through storage and a full wall slideout. The UFO platform's flat floor allows designers much more leeway in locating furniture and amenities. The coach's 22.5-inch wheels and cockpit door entrance give this 40-footer the look of a diesel pusher. Georgie Boy already is producing Cruise Master and expects to show a model in its booth at the 39th Annual Pennsylvania RV & Camping Show Sept. 10 to 16 in Hershey, Pa.
Cruise Master also takes advantage of the benefits of the gas engine that many consumers prefer. Fuel is more available; the engine is easier and less costly to maintain; and the chassis is dramatically lower in cost than a diesel platform. But Cruise Master has all of the pusher advantages that people desire. 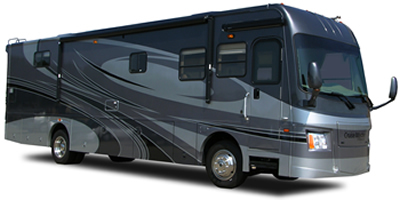 Georgie Boy is the sixth brand of motor home to integrate this revolutionary new chassis into its lineup. Because of the UFO platform's great capacity — a 26,000-pound GVWR — designers could incorporate many high-end features into this coach. Workhorse conducted extensive market research when it designed the UFO platform. "At Workhorse, we're the RV customer's advocate; and we're all about giving RVers what they want. This chassis is the result of extensive homework and collaboration with key OEMs," said Bill Walmsley, Workhorse director of marketing. 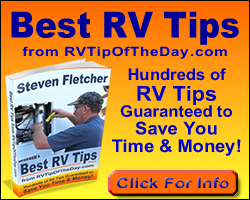 That research showed that more than 70 percent of current motor home owners prefer a rear-engine coach and more than 50 percent want a gas engine. And Workhorse performed extensive testing in Death Valley to ensure the coach's engine cooling system will operate perfectly in the hottest environment. "We've had hundreds of consumers test drive coaches built on the Workhorse UFO, and one of the consistent comments we're getting is the ride and handling of this chassis is superior," said Walmsley. "The chassis has a 55-degree wheel cut which makes motor homes on this platform much more maneuverable." "The Workhorse-Georgie Boy partnership is promising to be a very successful one," said Scheetz. "It's giving Georgie Boy customers a new and improved version of the Cruise Master that they've loved for years. The Workhorse UFO™ really is changing everything."